OnPoint: The facts at your fingertips! 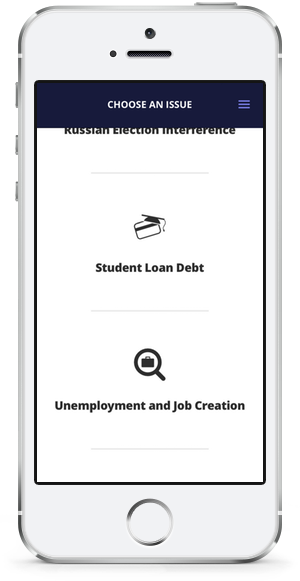 Vote Smart's free exciting new mobile app OnPoint arms citizens with up-to-date info on today's hot topics. Want to know how your officials relate to the big picture? Click the issue you're interested in and the facts you need are at your fingertips, curated just for you! So how does OnPoint work? Click a feature to learn more. OnPoint automatically geolocates to your current location, so you get the facts most relevant to you. The featured issues in OnPoint are carefully selected on a rolling basis to best reflect the current political climate. There are four types of data that you can browse: Statements, Ratings, Measures, and Votes. The facts are listed chronologically and relate specifically to your location. Navigating between pieces of data is simple. Here at Vote Smart, we take all of our facts directly from primary sources in order to remain accurate and non-partisan. See what your members of congress are saying, even just yesterday. View interest groups on both sides of the aisle and how they rate your officials/candidates. Find out if there are any upcoming ballot measures in your state and get a helpful summary. Check out the most recent vote in congress, your officials' votes, and visualize the breakdown. OnPoint can automatically geolocate to your current location. When you first open the app, it will prompt you to allow it to access your location. These permissions can also be set in your phone's settings. 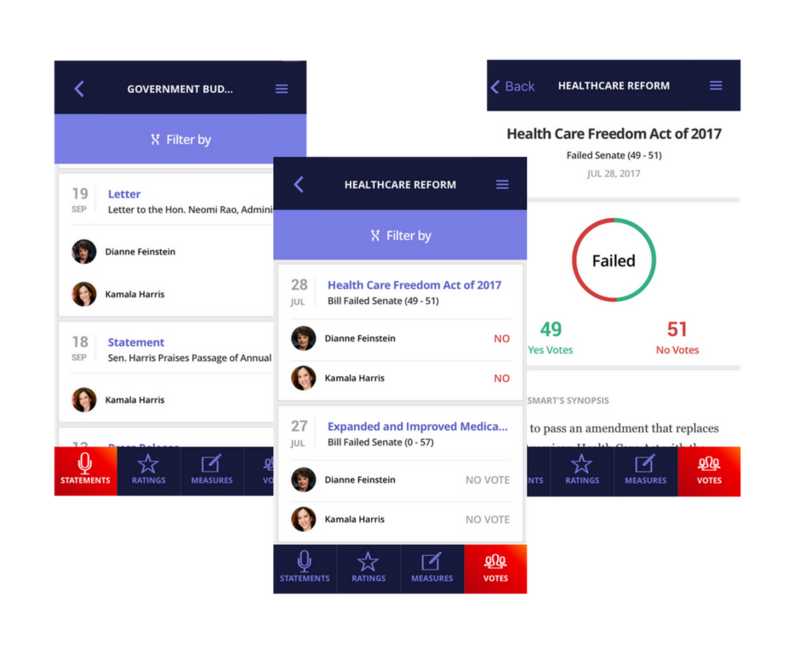 If geolocation permissions are set, the information displayed is specifically curated for your candidates, representatives and ballot measures. However, in a few simple steps you can geolocate to anywhere in the country. Select the Menu button in the top right corner. Type in the zip code or name of the city and state you want to geolocate to, and select "GEOLOCATE". When the app finds the location you are looking for, select "CONTINUE". You have now geolocated to your desired location. Choose an issue and begin your research! To return to your current location, simply return to "Settings" and hit the "GEOLOCATE" button -- no need to search for a zip code or city! After selecting an issue, you are presented with a short, comprehensive and nonpartisan description of that issue. Under the issue description, you can browse four types of data related to the issue you selected: Public Statements, Special Interest Group Ratings, Ballot Measures, and Key Votes. To see what your candidates and elected officials are saying, choose Statements. To see how special interest groups have rated your elected officials, choose Ratings. To see if there are upcoming or past statewide ballot measures, choose Measures. 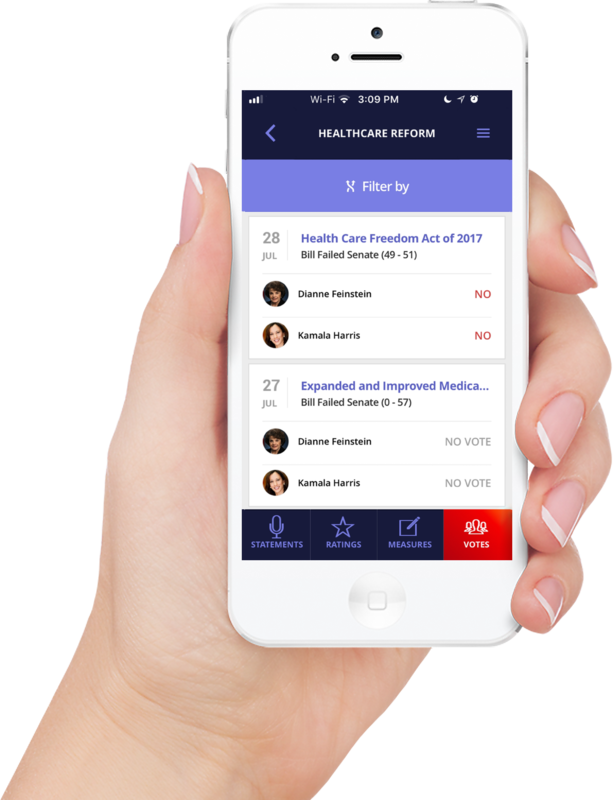 To see how your elected officials have voted on key legislation, choose Votes. You can also change the type of data you want to see. Simply select a different data type at the bottom of the screen. To go back to the last page you viewed, select the back arrow in the top left corner of the screen. To go back to the "Featured Issues" page, select the menu button , followed by "Home". To go back to the geolocation page and change your location in the app, select the menu button , followed by "Settings". Here at Vote Smart, we take all of our facts directly from the source in order to remain accurate and non-partisan. For instance, at the bottom of each Public Statement, you will find a link that can take you to the source of the statement -- oftentimes the politician's official website. You can then return to the app to continue your research. If you are interested in seeing where all of our facts come from, keep an eye out for links to the primary source! The data is listed chronologically and relates specifically to your location. Each type of data can be filtered. To do this, select "Filter by" above the list of data. You can filter by speech type in Statements, by year in Ratings, by ballot type in Measures, and by vote type in Votes. You can also search for keywords. Select a Public Statement to get the full text and a link to the primary source. Select an Interest Group Rating to get the full scorecard, read how to interpret the ratings, and learn more about the Interest Group. Select a Ballot Measure to get the official summary, the full measure text, and a link to the primary source. Select a Vote to get the synopsis and highlights, the stages of the bill, the voting record, a link to the full text, and a link to learn more about our Key Votes. To learn more about a politician, select their picture. A screen will load with their full name, office, state, party, and most recent or upcoming election. Select the group's name. This will take you to information that includes the group's self-given description, a link to their website, email, address, phone number and any endorsements they've given in recent elections. Selecting a link to the special interest group's resources will take you out of OnPoint and directly to that group's website, email, address, and phone number. Scroll down to the "Stages" section of the page. Select any other stages of the bill you are interested in viewing, including its introduction and any executive action on the bill.